Done!…….just finished this painting. Thanks to You all for checking on my progress. ok…….You know what they say, “You are only as good as your last project” so I Need to start something New! Whew!!! Where are my paints!……. 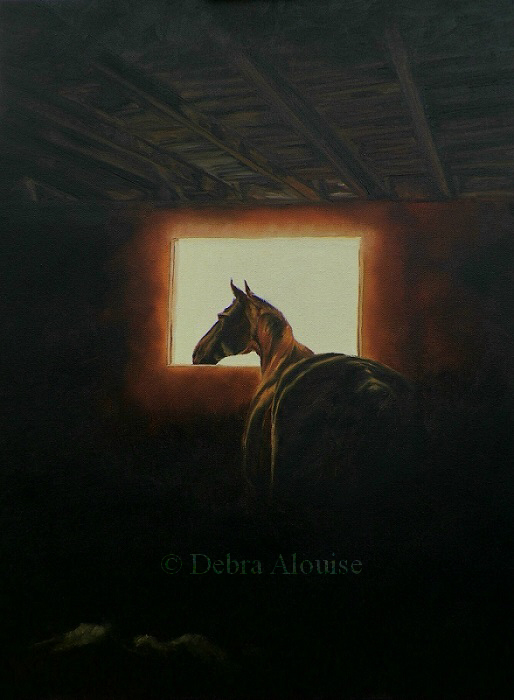 Placed in the Roof of the Dark Stall, I will lay in some deep darkish green color, as the Inside of the barn has become a bit damp looking, so I would like to put that in there. 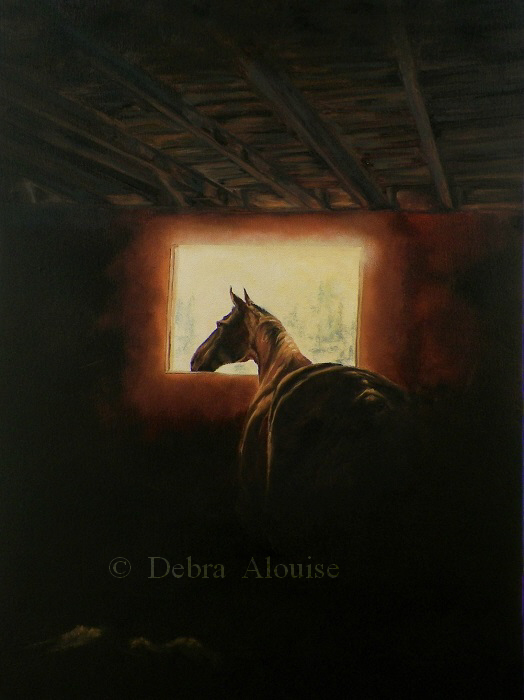 Its the aging barn that also is so neat in this horses, home. However I painted in the under part of the roof, the boards. I will also fine tune the horse and what is outside the Window. Just a hint is able to be seen as the light is so bright from the day. The mane will have some reflected light. I am also going to add some bright, bright to the left side, as this is the light source. So I am planning ahead and seeing what shows up, that is needed, its also so helpful to take these photographs to see how this is going. Thank You for checking in to see the progress of this painting. It’s fun for me and also, as mentioned helpful for me to see what still needs to be worked. This is in oils on a 24″ x 18″ stretched canvas. Painted in hand mixed oils.